12 pages of analogies for both receptive and expressive tasks! 26 analogy cards that include text and graphics (hip hip hooray!) for each analogy. extra cards to create your own! Expressive Task: Students will independently read or listen to analogy pairs read aloud by clinician and will state missing word that completes the second analogy. 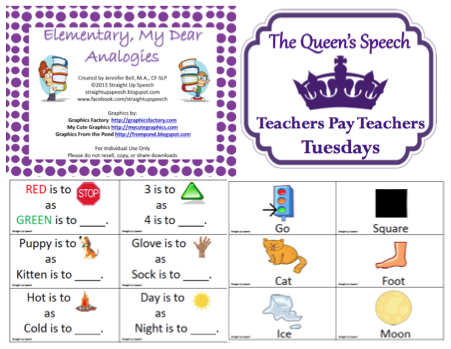 Receptive Task: Students will independently read or listen to analogy pairs read aloud by clinician and select word that completes the second analogy. I love that Jenn included graphics! Many products you will find on TpT do not include graphics for their analogies! I recently bought a pack of analogy cards from Super Duper Inc for $13.95! This pack is only $3.00!! Talk about a money saver! Wish I had this a few months ago!!! Overall: Do I need to do anymore convincing? This is just something you NEED in your therapy room! Follow Straight Up Speech on Facebook, Blog and TpT. What a terrific surprise! Thank you for choosing to review my analogies activity! I found that many of my clients had an analogies goal, but that I had very, very few items with which to address it. I have used this packet 6-7 times already with my own clients and they seem to be enjoying it as much as I enjoy using it! Hope your students will too! Thank you again for your kind words!